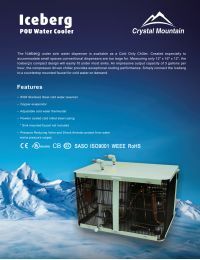 The Crystal Mountain ICS-P1LFL1C Iceberg Chiller is an undersink, cold only water dispenser chiller, which supplies cold water from a counter-mounted tap adjacent to your sink or handbowl on demand. This chiller was specially created to accommodate small spaces, which most conventional water dispensers are too large for. Measuring only 12" x 16.5" x 12", the Iceberg's compact design makes it able to be installed easily and discretely inside a base cupboard. Although this chiller is compact, it still features an impressive output capacity of 3 gallons per hour! The electric refrigeration unit is impressively quiet, and the compressor driven chiller provides exceptional cooling performance. These units have been designed for and tested in extreme temperatures for robust performance in all climates. The Neo-Pure Quick Change Filter Kit - The R1P Chiller does not currently filter the water it chills. Our water quality specialists designed this filtration kit especially for this chiller in order to reduce contaminants such as sediment, rust, cysts, lead, chlorine, taste and odor - which would otherwise not be reduced. The kit is composed of an NSF 42 and 43 certified filter, a mounting bracket, lead-free angle stop adapter, and all other necessary installation components. A Drinking Water Faucet - The R1P Chiller requires a drinking water faucet, but there is not one included with the chiller. We offer an array of high-quality, lead-free drinking water faucets to match any kitchen. NOTE: Sink mounted faucet and filter not included.